When I did my first degree I also worked in a factory for a couple of days of the week. This meant that I could guarantee spending 2 hours at a stretch sitting at a machine with nothing to occupy me but my thoughts. I wondered how to spend this time. I could not talk to my co-workers (the machines were VERY loud), so I was left with my thoughts. The obvious solution was to read and remember enough on the bus each morning to take me through the day – to find a wee bit of writing that would keep me going till the next break. I’ve always had a fairly good memory, but this really helped me to embed certain bits of writing in my mind. 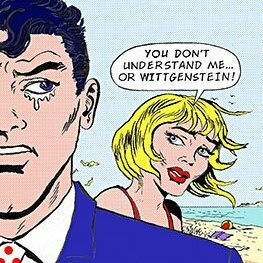 The main book I read at the time was Wittgenstein’s Philosophical Investigations, and bits of that still float into my head and DEMAND to be understood. Others tap me on the shoulder as I am thinking about something else and help me to put things together and make more sense of them. I was reticent, for many years, of using these in public lest anyone challenge my credentials. (Who am I to say what Wittgenstein really meant about a given topic?) But I think this reticence was unfounded. If the point of an aphorism is to provoke thought in the reader, then the intention of the writer is of no relevance, surely? I’m not arguing that there is no place for a careful examination of what an author meant, or intended, of course I’m not. I am saying that this is not the only way to use a writer.